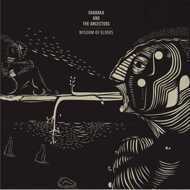 Wisdom of the Elders was recorded in Johannesburg in 2015 on one of many trips Shabaka Hutchings took there to immerse himself in the country’s rich musical heritage. The album is a psalm in nine parts. An episodic unfurling of a sonic journey across the Atlantic. “The grand scheme of this album is to present the musical language that I normally associate with my UK bands in the context of SA musicians and musical sensibilities,” explains Shabaka Hutchings. 8 men in a studio in Johannesburg; one tenor sax, one alto sax, one trumpet. One on vocals, one on ivory, one bass, one on percussion and one the drums. 800 million voices. 700 years. Millions of bones cracking under the weight of 22 false free years. Innumerable tiny sparks. One uncontrollable blaze.